We are market leader in delivery of reconditioned VDR equipment from Netwave / Rutter & Danelec. We have all spares on stock including complete VDRs, which are tested by certified engineers for a price, which is less then half of the new item price. Capsule for VDR Netwave NW-4000 - reconditioned in good working condition: on stock in Europe. Netwave builds on their reputation for manufacturing durable and reliable hardened storage servers with this unique and dynamic model. No other hardened storage server on the market boasts such a robust armoured stainless steel (A316) capsule or such an easy setup—you need only one single cable to connect the capsule of this HSS to its other components. You’ll also enjoy the IP66 WaveNet Quickconnect toolless connector for rapid connection. This HSS boasts a range of functional and aesthetic benefits, too. Choose from a selection of different colors, from standard fluor red (RAL 3026, for SOLAS compliant ships) to mega yacht-suitable RAL colours. 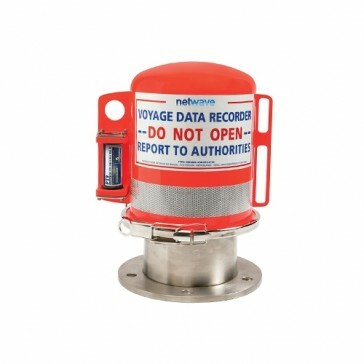 Deck mount the capsule at your discretion using optional stainless steel plates. Keep your data safe with this revolutionary new model: Up to 8Gb (4 Gb protected + 4Gb unprotected) is available for incident recording. (Minimum of 12 +12 hours) You’ll also have the security of a solid state drive with absolutely no moving parts. Please contact for other spares to CDRs from Netwave, Rutter or Danelec: we have all on stock for attractive prices. Our engineers are certified for APTs for the above mentioned VDR types.